The library bee hives can be seen from inside the bridge near Seeds Library Cafe or from the Boulder Creek Path or inside the Japanese Garden at the Main Library. Why is the library growing a garden and building beehives? The City of Boulder is committed to the protection and diversity of pollinators and encourages our community to take action to protect them. Pollinators, such as bees, moths, butterflies, hummingbirds, beetles, flies and bats are responsible for the production of most of the flowering plants in nature that produce fruits, vegetables, and seeds, maintaining the health and beauty of our shared grasslands, forests, meadows, gardens, and other natural areas. The City of Boulder committed to be neonicotinoid-free on city property and public spaces. Neonics are a class of systemic pesticides that affect the central nervous system of pollinators and is greatly contributing to the decline of honeybees and our native bee population. Boulder Public Library and community partners are offering a series of events and services on sustainable living called Seed to Table which includes the Edible Learning Garden, Bee Literate library hives, Seed Library, Pollinator Appreciation Month activities and programs with Seeds Library Cafe. Location of the hives – The flight path of bees from the hive is usually in an upward arc away from the hive. The hives are elevated well above people’s heads and are out of the path of humans. Bees fly up to a 3-mile radius to forage for nectar and pollen. The elevated location of the hives protects people from the bees and the hives from most foragers. Wasps vs. Bees – More than 95% of all stings are from wasps. Most honeybee stings come from sitting on or accidentally squishing a bee, and a stinger is typically left behind for evidence. There are many feral hives around the neighborhood, including several on Pearl St in the Cottonwood trees. There are few summer blooming flowers in the Japanese garden which lessen attractors for the bees to come into the garden and same with the Boulder Creek path. There are between 500 to 1500 hives in Boulder, and you will not notice any more bees in the flowers around the library than before the library hives were installed. Bears – We met with a district wildlife manager from Colorado Parks and Wildlife and took action to reduce access and attraction for bears. Recreation and Facilitates and Asset Management are also partners in making this project a success. Honey – We don’t plan on harvesting any honey during the first year as the hives are getting established in their new home at the library and the bees will need the honey as food for the winter. Depending on the harvest volume in fall 2018, we may use the honey in library programs; Seeds Library Cafe may incorporate the honey in their food or beverage offerings, and we may be able to make some of the honey available to the public in other ways. Where did the bees come from? The Bee Literate hive was populated by a packet that was driven to CO from CA and donated by Miles McGaughey [company name here]. The Booked Bee Bed and Breakfast hive was populated by a swarm relocated from the property of one of the BeeChicas. Where did the names of the hives come from? 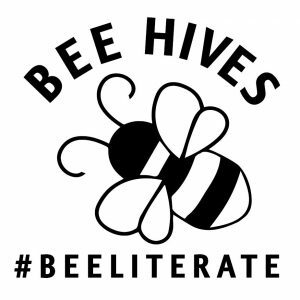 The BeeChicas invited beehive building participants to submit name ideas and they picked Bee Literate and Booked Bee Bed and Breakfast. The bees will know their home by smell. Humans generally find names easier to distinguish between the hives. What can I do in my community to support pollinators? Plant-pollinator friendly gardens especially with indigenous flowering plants. Don’t use pesticides. Make water available to birds and insects such as a bird bath with stones or marbles to give the bees a place to stand while drinking. For more suggestions, visit Pollinator Appreciation Month website. The unseasonably warm weather this winter had an unexpected impact on our library beehives. A varroa destructor mite infestation weakened the Bee Literate hive to the point where the colony could not maintain the 90F+ degree temperatures needed to survive colder winter days. The warmer temperatures fostered greater bee activity, and mites spread to the Bee Literate hive. We will repopulate the Bee Literate hive by splitting the other library hive, Booked Bee Bed & Breakfast. Visit the City of Boulder’s Climate Action page to learn more about how to reduce our environmental impact. Sounds like something out of a sci-fi film, but the varroa mite is truly an awful creature to a bee or beekeeper. It is a parasitic mite that poses a huge threat to honeybee survival. Mites feed on a bee’s hemolymph (circulatory fluid similar to blood) weakening their immune response over time. Imagine a tick, the size of a dinner plate, on your back that you can’t remove. Mites can crawl from one bee host to another, spreading viral diseases that undermine the health of the colony. A mite population can grow rapidly if left unchecked. Beekeepers have developed a range of tools to combat mites. Formic and oxalic acids are naturally found in hives. Large concentrated quantities of these acids can be effective at killing off mite populations. Forcing a break in the brood cycle has proven successful in keeping mites in check. Breeding mite resistant queens and hygienic bees are also being explored as additional tools. Most beekeepers successfully overwintering their hives use a combination of these tools. In late August, the BeeChicas checked the mite levels in the library hives. Even though we found levels below the threshold for treatment, we decided to treat the hives with formic acid (MAQS) as a precaution. European honeybees are great at robbing honey from weaker hives in the fall. Unfortunately, mites have become equally great at climbing onto healthy robbing bees. Beekeepers are finding that mites are growing more virulent and “jumping ship” when their host bee is weak and dying so the dying hive produces a varroa bomb which infects a healthy hive. This is typically a problem in the fall when mite levels are at their highest and nectar flows have dried up. This year we have found high winter mite counts in our home apiaries as well as both hives at the library. The Bee Literate hive mite load was extreme. We discovered in January that the hive population died out. Fortunately, we were able to address the mite load in the remaining library hive with a winter treatment of oxalic acid. This spring we plan to split the active hive or catch a swarm so we have two thriving beehives again at the library.